I have a 1 in 542 chance of dying in the next year. In other words, for every 542 men who are the same age as me, one will die in 2012. For those of us who survive until 2017, the probability of death during that year will be 1 in 364. This probability will increase fairly predictably over the years. 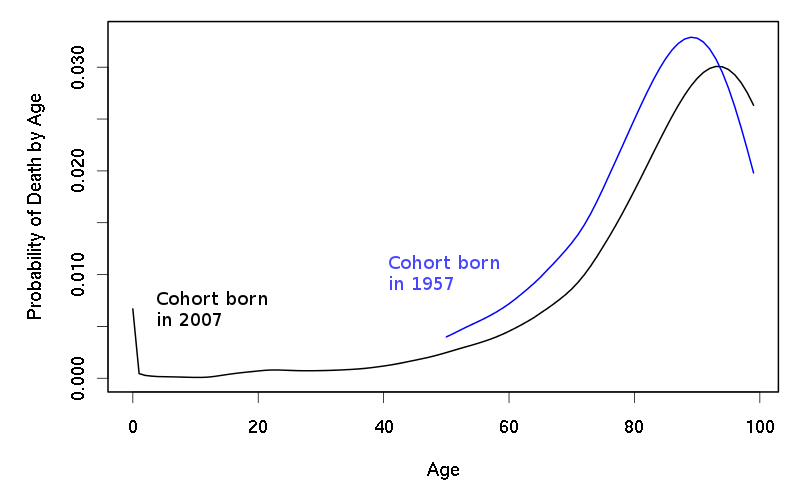 Gompertz Law of human mortality suggests that the rate doubles every eight years. Supposedly, this law stands the test of time and across populations. I'm certain actuarialists routinely figure out probabilities that a man my age will become seriously ill or disabled as well. Statistics put mathematical meat onto a mild, chronic anxiety about dying or becoming ill. It's something that most of us feel and I don't trust people who say that they don't have any anxiety about it. What does one do with that anxiety? Prepare. Prepare for the "worst case" scenarios. Name a surrogate. Talk to that surrogate about theoretical scenarios and make sure they know what you value most. Put it in writing. Get life insurance. Learn to respond to the anxiety you have. If you make it through this next year, the chances are lower that you'll make it through the subsequent year, so you might as well get ready. Don't be superstitious. Acknowledging death does not make it happen. Live your life. There is a 99.8% chance that you'll live through the next year if you are my age and your life expectancy going forward is an additional 40 years. Save for retirement. Anticipate being around to pay for your kids' college education. Exercise. Eat well. Seek appropriate preventative healthcare. Find what you love to do and do it. Breathe. And if you live long enough, you'll likely develop a chronic disease. People are remarkably resilient and can adjust, so don't worry about this too much. With illness, you'll likely develop a greater awareness of your own mortality. Hopefully, you've prepared. If not, it's never too late. But you'll go to your doctor with the expectation that he'll help improve your quality of life in the face of the chronic disease and also that he'll know what to do to help you avoid death. You've seen the ads on TV for such and such a pill which will improve your vigor. You'll look ten years younger than the average person with your condition, be able to win the stuffed animal for your grandkid, and the lights will go off in your bedroom a full 30-45 minutes before you plan on going to sleep. You imagine it to be so perfect that if a life-threatening condition arises and your doctor doesn't have a pill to fix the problem, you'll think, "This is the year 20XX, why don't they have a pill for this?" This is the generic frame for the typical clinic visit for patients in the early 21st century. You know that doctors can't fix everything. Your doctor knows she can't fix everything. Both facts frequently go unspoken between the four walls of the clinic room as both sides labor to prevent a "premature" death. It's a noble and worthy goal but Gompertz Law remains. It occasionally crosses your mind: What would it be like to get sick, what type of interventions will you have to go through, what will happen if you become ill and don't have enough support to remain at home? It's crossed your doctor's mind, too. She's seen others go through it, but it's easier to talk about A1C's, LDL's, and holiday plans so concerns go unspoken. Advance care planning in the office remains challenging for multiple reasons, but the frame of the visit does not easily permit acknowledgement of death or other difficult outcomes. Enter ePrognosis. Researchers from UCSF (including colleagues from Geripal) reviewed prognostic indices for older adults in JAMA last week. The research and the slick new ePrognosis website with easy to use prognostic indices has been widely publicized (all the way around Le Monde!). Their review identified several indices for predicting prognosis in community dwelling, hospitalized, or nursing home bound older adults. The indices aren't perfect. For instance, most need more testing for validity in heterogeneous populations. (See Ken Covinksy's wise analysis at Geripal.) If you're looking for an "expiration date" (who would do that? ), then don't hold your breath. We can look at actuarial data or Gompertz Law to get a general sense of prognosis. The tools on ePrognosis sharpen the lens based on variables related to disease state, functional status, etc. I've written about the importance of framing for discussions about code status in hospitalized patients. In that setting, it's helpful for the patient and doctor to have a common understanding of the patient's prognosis before discussing the code status decision. The same principle applies to the outpatient setting in a non-terminally ill population. My hope is that ePrognosis will help providers prepare the frame for the advance care planning discussion. As Carol Levine points out in her comment below Ken's Geripal post, ePrognosis may unintentionally turn into a "parlor game" for the general population. Even though ePrognosis is intended for provider use, I'm not convinced that use amongst the general population is a bad thing. It may be quite the opposite, as long as you can go "talk to your doctor" about it! It's always appropriate to prepare for multiple scenarios. Explicit discussion of prognosis, while not an absolute prerequisite, can serve as an entree to discuss the possible scenarios. 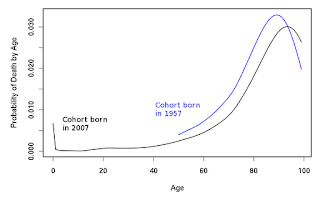 The healthy young man looks at his probability of death and buys life insurance but prepares at the same time for life as a 50, 60, and 70 year old. In old age, it's still appropriate to prepare for multiple scenarios. If you are an 80 year old with a Mazzaglia Index score is 3, then you have an 8% chance of dying in the next 15 months and a 30% risk of being hospitalized, it makes sense to do some preparation for those events. However, you also have a 92% chance of NOT dying in the next 15 months. What then? What will it take for you to age in place? What happens if frailty or other circumstances make this impossible? Prepare for the most likely and worst case scenarios. It should be your expectation that your healthcare team can help you prepare. In the JAMA article, the authors suggest using the indices to guide discussions about preventative care (such as whether to pursue a screening colonoscopy in a woman with advanced COPD and comorbidities). This use of the indices makes sense. Colonoscopy, while generally safe, is not without risk of complications, especially in older adults with comorbidities. It's appropriate for physicians to use the indices along with their clinical judgment to guide their recommendations. This has brought about accusations of bedside rationing, which is really a separate discussion. Medicare covers screening colonoscopy once every ten years. I wouldn't anticipate physicians refusing to order a colonoscopy for a non-terminally ill elderly patient based on a prognostic score. It remains to be seen whether ePrognosis will increase awareness of prognosis in non-terminal, older adults or whether this will impact clinical decisions. I think it will. Time will tell.